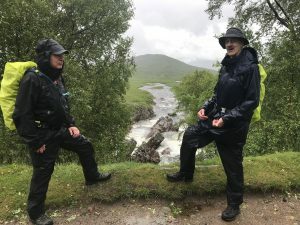 Our briefing last night included a wet weather warning and a detailed explanation that, as well as dealing with a copious amount of water, we would be undertaking three stiff climbs on the West Highland Way. Fortunately, a couple of us had made use of the Glencoe Hotel’s pool, sauna and jacuzzi, a welcome relief after 7 days on the move. And at this point it is worth making a special mention to the staff at the hotel, especially Roman, who were very helpful and made our stay very comfortable. After a good breakfast we jumped in the van to drive to our start point at the Kings House hotel which, when we arrived, we found was being completely rebuilt. Given the state of the weather (chucking it down) we drove back up to the main road and were instead dropped at the Glencoe Mountain Resort, a mile up the planned route. It was a little embarrassing to start our walk alongside a couple of hundred people who had arrived to run a race of 32 miles on the trail. The first couple of hours of our walk were spent with our hoods up and heads down nodding at super fit runners with amazing ankles. Quite humbling. 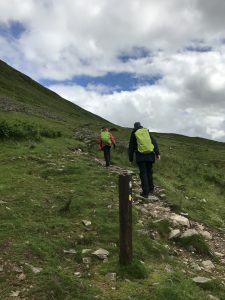 It also quickly became apparent that this was a busy trail with plenty of people hiking in the other direction which made the constant rain bearable as we shared many a cheery “Hello” and “Lovely day for it” with people from all over the world. Quite amazing how far people had come to walk this lovely path. We eventually made it to our halfway point, the Bridge of Orchy. On the way down to the river the sun had come out and we had met a charming English gentleman, a fan of Bill Bryson, called Richard, walking in the opposite direction in shorts! After a short conversation we found the river and the author had the wonderful experience of meeting two miniature dachshunds who cheered him up immensely! Unfortunately, as we sat down for lunch at a picnic bench, and just as we had all opened our backpacks and taken out our packed lunch, the heavens decided to dump a right royal load of water on us. Queue rapid evacuation and lunch eaten under the eaves of a local hotel. So much for a rest. We set off after lunch in the rain and under the railway line. This line is the mainline between London and Fort William for the overnight sleeper train and it was great to watch the southbound train pull in and out of the station as we started our afternoon walk. 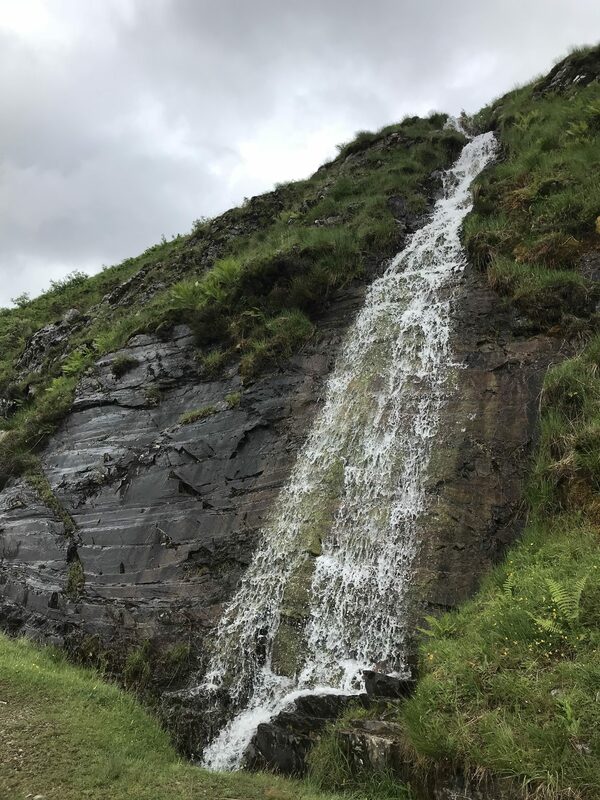 The West Highland Way cuts through striking hills (the English would call these mountains) and was originally built as a drovers’ path and for a long time was the main highway north. The path now switches from a well-made compacted gravel path, to tarmac to a loose collection of stones and rocks. In the wet weather the path doubles as a waterway so we spent most of our day walking in a stream! 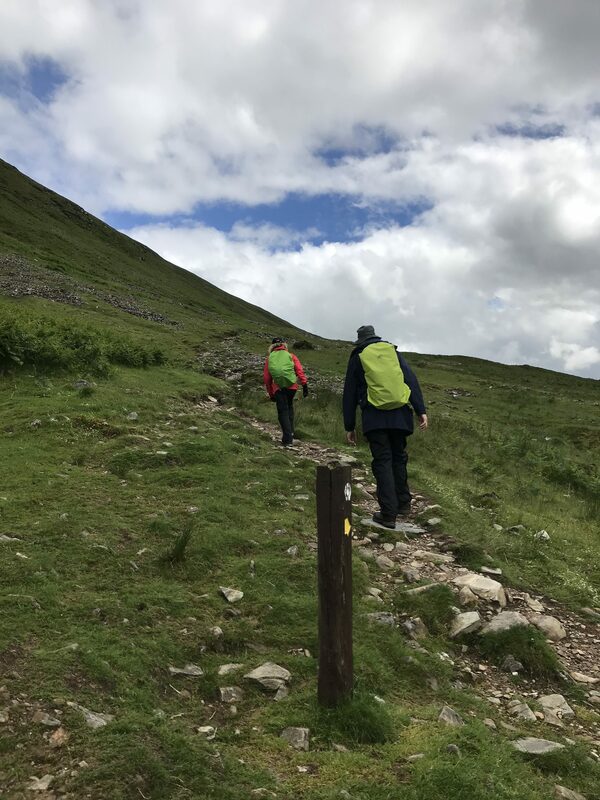 Mid-afternoon, as we started our last climb the clouds parted and we found ourselves walking in wonderful sunshine, along a valley tracking the railway line. The water was running off the side of the hills and soaking our feet but we did not care. As we arrived at our hotel in Tyndrum at the end of our day’s walking it occurred to me how wonderfully organised this walk has been and now is a good time to mention the Architect of the walk. 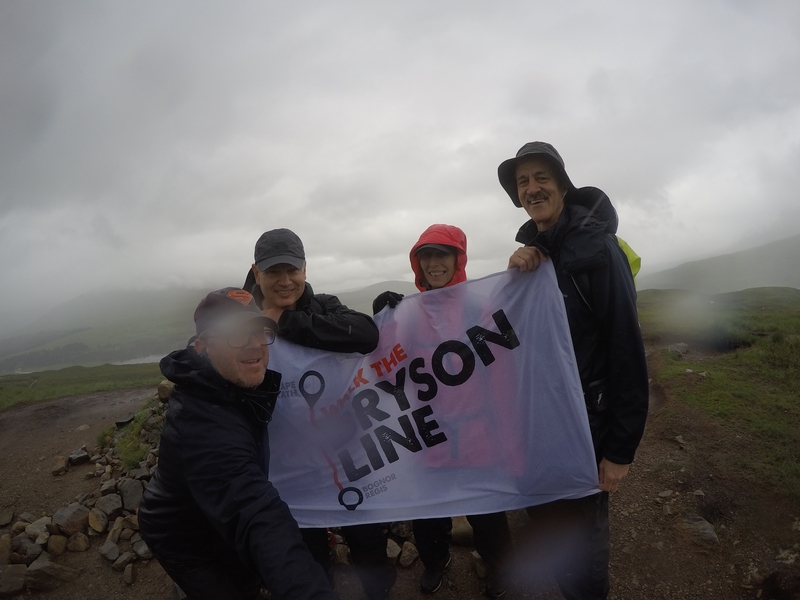 Eric Scoones was asked by Jeff in late 2016 if he could help us create the route for Walk the Bryson Line. Eric did not hesitate to say yes and threw himself into the task. 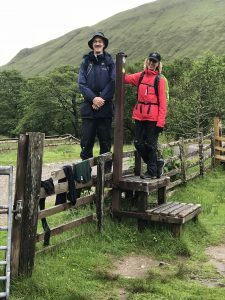 It was Eric who suggested we walk 569 miles (the straight-line distance) rather than try and plot a continuous route from Cape Wrath to Bognor Regis. This was a great idea and it made this mad walk possible. Thank you Eric! If you have given – thank you so much! If you haven’t you can do so by clicking this link.